Built as a ferry under yard No. 635 by Harland & Wolff at Belfast for the Belfast Steamship Co. Belfast. 24 January 1929 launched under the name ULSTER MONARCH, two sisters ULSTER PRINCE and ULSTER QUEEN. Tonnage 3.735 grt, 1.781 net, 828 dwt. Dim. 358.9 x 46 x 14.10ft. (draught). Powered by two 10-cyl. B&W diesel engines manufactured by shipsbuilder, 7.500 bhp., twin screws, speed 18 knots. Accommodation for 418 first class, 86 third class passengers, later altered in 391 first class and 58 third class. Loading capacity of ca. 700 tons. 11 June 1929 delivered to owners. 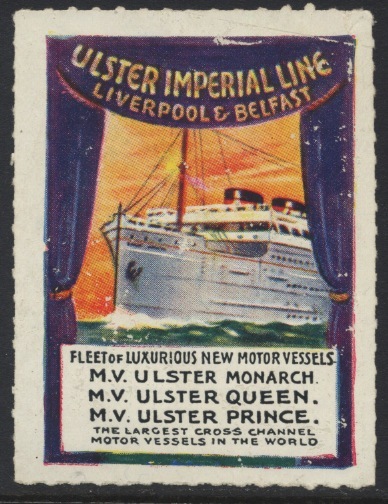 After delivery used in the night service from Belfast to Liverpool, in the Ulster Imperial Line. Mostly the vessels in this service sailed from Liverpool at 22.15 with arrival time Belfast the next morning at 07.30. The same day in the evening at 21.00 she sailed from Belfast and arrived the next morning at 07.30 at Liverpool. During the stay in port during daytime, the cargo was discharged and loaded. Till the outbreak of World War II she was used in this service till 07 September 1939, after arrival in Liverpool she got orders to proceed to Southampton. 11 September 1939 she made her first troop transport across the English Channel to France. 21 September 1939 she was transferred to the Bristol Channel and from there she left with troops on 24 September for Quiberon Bay, she made two voyages more to this destination from the Bristol Channel. She was then released from trooping duties on 13 October and headed for Liverpool. Two months later she was required again for trooping duties and made regular sailings from Southampton to Le Havre and Cherbourg. 08 January 1940 she went aground at Dunnose in the Isle of Wight. 24 April 1940 she received orders to proceed direct from Cherbourg to Scottish waters, was delayed for some time off Dover, at least headed north up the coast of East England. 26 April 1940 at Leith she embarked troops for Scapa Flow, but before she sailed the situation in Norway was deteriorating and her troops were disembarked and she had to join a convoy to Andaisness, Norway after arrival there the town was burning after a air raid of a German air-attack. After she moored she received orders to leave full speed out of the fjord, which she did. Off the land she was attacked by an aircraft, dropping four bombs near the starboard side and four more on the port side, but she escaped with only deck doors blown off there hinges. She sailed to Scapa Flow where she loaded 100 tons of ceased aviation fuel and naval and military personnel, with as deck cargo more as 50 barrels fuel oil for her one use. 10 May she sailed from Scapa Flown bound for Harstad in Norway, under constant air attacks she discharged her men and cargo there, and loaded some fish, which during bombing was killed in the water near her, embarked troops and sailed for the Clyde on 16 May. 31 May, she made an other voyage to Narvik, Norway to load there material and troops, when the Allied troops were withdrawn from that port. 14 June 1940 she left with Polish and French troops on board from the River Clyde, arrived Brest 16 June, on arrival there the French troops embarked but the 400 Polish troops seeing that the end of the war in French was nearing, decided to stay on board, the empty space was filled with British troops before she sailed on 17 June from Brest, she was the last troopship that left from this port, she was bound for Falmouth. 02 July, her next voyage was with French servicemen from Liverpool to repatriate these men to Morocco. Then she made a roundtrip from Gibraltar to Madeira, starting 21 July before she headed to Glasgow where she arrived 3 August. Then she made two voyages northwards first with troops to the Faroe Islands, and in September with 700 troops on board to Iceland. 24 September she sailed for the U.K. again. 05 October 1940 renamed in HMS ULSTER MONARCH, fitted out at Glasgow. Armament 1 – 12pdr. and 4 – 20mm guns. 17 January 1941 arrived at the Inveraray Combined Operations Base. March assigned to Operation Puma, the planning landings at Las Palmas, in the event that Gibraltar was falling in enemy hands. From 22 till 28 July she made a roundtrip to Iceland, following by exercises at Scapa as training for the Puma Operations, at that time the name was changed to Pilgrim Operations. 16 September she sailed from the Clyde bound for Freetown where she arrived on 05 October, later moved to Takoradi and Lagos. She made two voyages north to Gibraltar, first on 18 November, the second on 10 February 1942, when she sailed from Gibraltar with on board 655 troops bound for Bathurst. Then she embarked servicemen from Freetown to Lagos where she arrived 10 March. After she returned in Freetown she took on board troops and via the Azores sailed to the Clyde where she arrived 11 April 1942. Between 19 April and the end of June she got a refit in Liverpool as a Infantry Landing Ship, and on 31 July arrived in the Solent to receive six landingscraft, thereafter she was a unit of Operation Torch. 26 October 1942 with on board US Rangers she sailed from the Clyde. 07 November arrived Arzeu Bay and at 23.41 troops were embarked, before she headed to Arzue harbour the next morning where her stores were unloaded. 17.15 The same day moved again to the anchorage. 21 November 1942 arrived again in the Clyde without her landing craft but with on board 120 survivors from HM cutters HARTLAND and WALNEY which both were lost during Operation Torch. Then she was used during Operation Husky, the landing in Sicily. 13 March 1943 sailed from the U.K. and via Gibraltar, Freetown and the Cape of Good Hope sailed to Suez to join Force G on 14 March. Took part in the Combined Operations exercises in the Gulf of Aquaba, where after she embarked troops, transited the Suez Canal on the first of July. Became a unit of the assault convoy which sailed from Port Said on 05 July bound for Sicily. Her troops were landed on 10 July at Acid North Beach-head near Syracuse. Two days later she landed a SAS unit south of Augusta. Then she took part in Operation Avalanche. She was attacked on 19 Augustus at 00.12 off Cape Bon, Tunisia in a bright and moonlight night, the plane came from astern and dropt a bomb on her after 12 pdr. gun, the explosion pierced two decks down, killing three crewmembers, and set the ULSTER MONARCH on fire. The fire was brought under control within 40 minutes and she proceeded to Tripoli where she underwent some repair. 06 September sailed from Tripoli as part of the Northern Attack Force R for the landing at Salerno and the mainland of Italy. Her troops and equipment were discharged on 09 September, and on 11 September she brought some reinforcements from Bizerte to Taranto. 05 October she disembarked personnel and landingscrafts at the Combined Operations base at Djedjelli before she headed to the Clyde for a refit. She took part in Operation Neptune, the landings in Normandy. 05 June 1944 sailed from the Solent in Assault Convoy J9 and put her troops ashore on Juno Beach early the next morning. She headed then to Plymouth to embark reinforcements for France, the rest of the year was used in these Channel crossings with reinforcements. 01 January 1945 arrived in the Thames Estuary and on 03 January sailed from Tilbury to Ostend, Belgium in the Forces Duty Service between these two ports. 19 May 1945 her landingscrafts and launching equipment were removed. April 1945 she got engine problems and was out of service till 19 June, before she resumed her trooping duties from Tilbury, Dover and Harwich. 07 September 1945 sailed from Tilbury and arrived 09 September at Belfast. 01 October 1945 paid off. After repairs which took a long time she arrived at Liverpool on 13 August 1946 to resume her service between Belfast and Liverpool. October 1946 sold for scrap. 08 December 1966 arrived by the breakers yard of van Heyghen in Ghent, Belgium for scrapping. Maldives 1997 3r sg 2687, scott 2226e. Source: Merchant Ships of the world in color 1910-1929 by Lawrence Dunn. Register of Merchant Ships completed in 1929. Short Sea Long War by John de S. Winser.